So, for those of you that remember back in “the day”, we had the Age of Aquarius. Today, we have the Age of Digital. They’re everywhere…..on your phone, on your IPad, on tiny cards that come out of your camera. Just on phones alone (using those ever reaching selfie sticks), we are the most photographed generation that ever lived. My granddaughter (who is a teen) takes more selfies, on any given day, than photos that I have of my entire life so far. This may be old and tattered but I do have it! 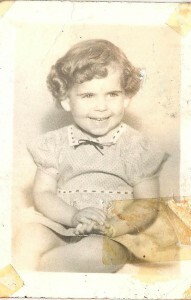 Not sure what my mother was THINKING with the curls though. I mean, I think it’s GREAT that we always have our phones on us and they have advanced in such a way that the cameras in them are REALLY good. There are even classes now on how to take better photos with your phone. You don’t always have to carry your camera which can be cumbersome. Yet if an unexpected photo op arises, you’ve been able to capture it. It’s AWESOME. Families can take tons of photos of the little one and then sort through to find that perfect shot. You can’t do that with film. You may take a lot of photos but it’s expensive to develop and print all of them to find that ONE that you like. That is, if you do find it at all. With digital you can also “fix” any flaws in Photoshop or any other image adjusting program. You can share your photos with ease whether it’s on Facebook, Instagram or simply email. There is no wait to send a print to Aunt Bessie. Who hasn’t been in a conversation with someone and pulled out their cell phone to show a photo? It happens all the time. So, what’s the problem? Is there a downside? Perhaps. Many of these photos never get printed into a hands on photograph. This means that you will always have to look at them on a computer or some other device and without that interface, you have nothing. Technology changes so quickly. I remember when my parents took movies that ended up on big reels. I can’t even watch these movies now. I suppose they can be converted but at what cost? Floppy discs went by the wayside a while back. You can hardly find a computer to use them in. How long will it be before DVDs will be obsolete? Unless you download photos from your phone to something else more permanent, they will be gone. This means that the memories you’ve captured will be gone as well. Each one of these memories are the thread that, in the end, weave together to create your life. If you are part of this Digital Age, it’s wonderful. There is so much to be said for it. However, DON’T leave your memories on a phone or computer or card. Get the photos out. Print them and tell your story. Put them in albums and actually tell the story in words by journaling. These photos are something that will pass from generation to generation. For all the visuals like me, it helps to SEE that old farm house that grandma grew up in or SEE me when I was a baby. You get the pix (no pun intended). LOL. Don’t be part of the generation that has TONS of photos but nothing to actually SHOW for it. Yep, digital has a lot of advantages but once the memories are lost, there is no replacement. Something to think about. Please leave questions and/or comments. ← What is Copic Marker? What a wonderful poignant post this is! The bitter-sweet of Digital – as you say, so convenient but easily lost. Another part of this is social media – all of these photos/selfies that people upload are there on the internet forever, on cache’d websites, for people to view and interpret as they will. The prospective employer reviews a candidate on Facebook and sees photos of them drunk etc., which could then affect the interview process! I think it’s a good ethic to suggest if you take the time to snap the photo, make the time to save it permanently. I’m looking forward to reading your other pages and posts on your fascinating site. Thank you for visiting, Kaz. I do love digital and the fact that you can take a ton of photos and choose from the best without spending a lot of money printing. However, I now have more photos than ever and sometimes that gets overwhelming. Yes, when people post photos on social media, they don’t always remember that EVERYONE can see them. I know you have some control but truly not enough. Employers now ARE looking at social media. You can put your best foot forward at that interview but your true self comes out on social media. Such a dilemma. I agree with you totally about the pros and cons of digital. Love the ease and ability to take large numbers but saving is the key. I have resorted to an external hard drive with a usb plug because I have so many. I did lose some in a phone crash that were dear to me and learned my lesson to download. Organizing was a chore until I got into a system. I now use onedrive,live and it systematically saves everything by date! It’s in the cloud so I still try to make time to download to my external hard drive. (folders by date). I know whats wrong with my brain. On the right side there is nothing left and on the left side there is nothing right! Dennis, I find I take SOOO many pictures that honestly, I have a hard time keeping up. Sometimes it’s hard to get the right shot though so you just keep snapping. This is especially true when kids are involved. Out of 10 photos, I may find one good one. I too have an external hard drive but it’s pretty full. Perhaps it’s just a sign of a life well lived? At least that’s my story and I’m stickin’ to it. Hi You have a nice right Brain website 😉 Your point about digital photos lost is so true…I lost a “bunch” of pics because of a back up problem… Keep going that way !